Opening Friday January 10th showing thru February 4th 2014. Featuring works from Aramis Hamer, Doriane Nieburgs, Doug Zimmerman, Frances Herring, Jennifer VanderWege, Jessi Nester, Laurie Miller, Michael Drew and Whitney LaRene. Artists present. Open only until 8pm. Rich, colorful acrylic textures on framed wood by Ruty Daniels. The paintings incorporate a variety of common object materials to create a 3-D feel. Artist present. Narrative inspired folkloric mixed media illustrations by Amber Frederick using natural materials with various paints on paper. Artist present. 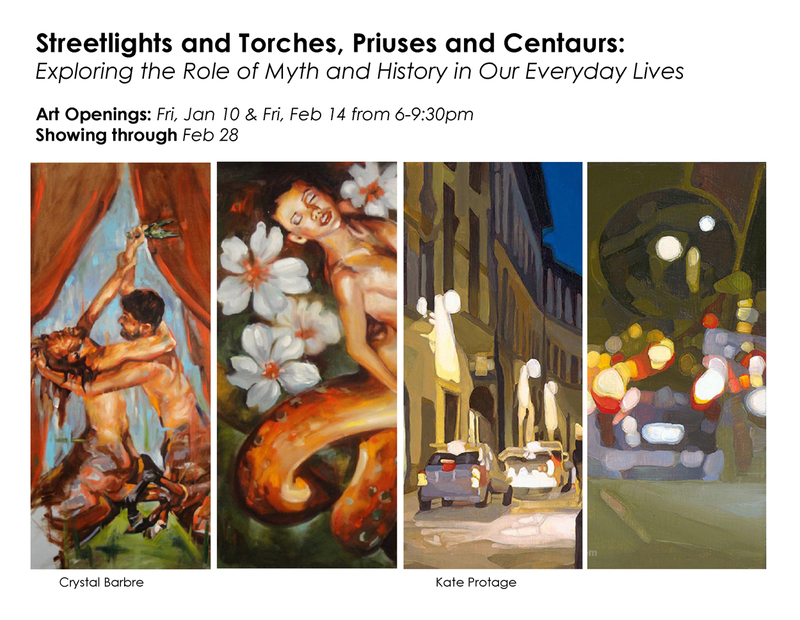 Streetlights and Torches, Priuses and Centaurs: Exploring the Role of Myth and History in Our Everyday Lives. In this two-person exhibition, Crystal Barbre and Kate Protage use paintings and drawings to explore our relationships to mythic themes, and the connections between our modern world and our cultural lineage. In this exhibition, Barbre and Protage use contemporary models to tell ancient stories, and surround them with elements that are both old and new, just like the art that they’ve chosen to reference. They’ve taken that art that appears on the side of the road and offered their own take on it, right down to depictions of the local traffic that flows around it. Their paintings and drawings pay homage to the work of ancient times, and reframe that work in today’s world. Artists present. Featuring the work of Colleen Stevens. Steve Cheseborough–PNW Folklore Society Coffee House Concert 7:30pm. Free. Come down, hang out and find something awesome. Featured artists include Alexandria Sandlin, Artifakt Ripley, Christopher J. Olson, Chani Murat and Xavier Lopez Jr. Artists present. World photography by Matthew McSheehy. Artist present. Lucy is a Phinney Ridge/Greenwood native and at 7 years old shows true potential as an up and coming Seattle Artist. Her parents don’t know where her inspiration and drive for creating art comes from; it’s something innately a part of her spirit and being. Lucy draws and paints original works of art and we are pleased to feature her in the first ArtWalk of 2014. Artist present. Oil paintings by Magda Petrou. Fine art photography and acrylic paintings by Alexis Henry and Jon Moore. Artists present. 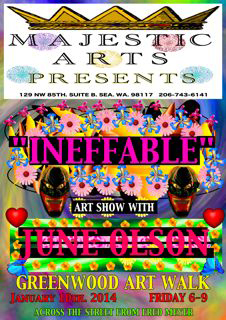 Artist June Olson is a visual artist that works with acrylics and multi-media. Also, we’ll be having a show dedicated to Tesla on January 18th. Artist present. Artwork by Antoinette Hippe. Acrylic on Canvas: in the traditional and modern fashion of Henna. Psychedelic and surreal ink on paper by Rocky Mamotyuk. Artist present. Rotating artwork by local artists. Join us at the Phinney Center Gallery in January for our show titled Neighborhood. 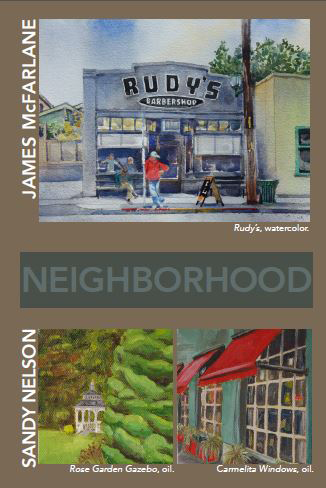 James McFarlane and Sandy Nelson have created a series of paintings to document the unique personality of our own neighborhood, Phinney Ridge in Seattle. The show will be in the gallery from January 3rd – January 24th. Join us for the opening reception on Friday, January 10th 7-9 pm. Artists present. Art site providing light h’orderves and beverage. Mike Reid is from Seattle and loves living here, having been most everywhere else. He is primarily a Canon floral and landscape photographer. Thin depth of field his poetry. He mostly shoots Canon 5D2 and Zeiss prime lenses. He sees potential photos everywhere he goes. Nothing makes him feel the way he feels with a camera in hand, eye pressed to the eyepiece. I hope you can get a sense of this feeling in what you see here. On the walls from our Holiday Showcase, you’ll find original artworks by: Glitter Mortis, Braden Duncan, Krista Jefferson, Michele Lynch, Phresha, Siolo Thompson, Court Hoffman, Jess Redstone, Corey Skillman, Red Hardwick, Jody Joldersma, Deviant Decor, David Vonderlinn, Justin Hillgrove, Jessica Wilkinson, LampCycle, Susanna Prince, Olvera Designs, Brenda Dunn and Wilky.Artists present. “A Child’s Heart” artwork featuring over 30 Seattle contemporary artists including Henry, Jeremiah Hammer, Justin Hillgrove, Andrew Miller, Xavier Lopez. and more. 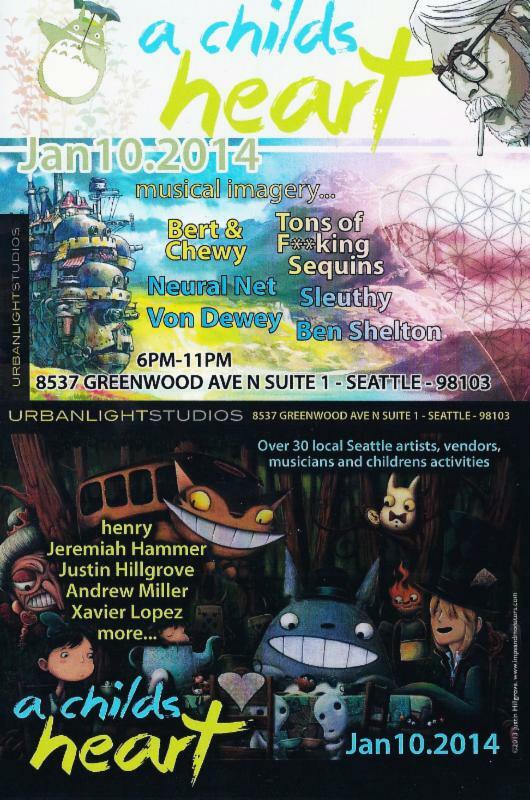 Plus musical imagery by Bert & Chewy, Neural Net, Von Dewey, Tons of F**king Sequins, Sluethy and Ben Shelton. Artists present. Group show of paintings, drawings and digital prints mostly in comic art and pin-up style by Scott Faulkner, Tom Dougherty, Marc Palm, Dalton Webb and Stevie Van Bronkhorst. Artists present.